"Finally Infinite" is a the long due brilliant comeback album from Austin Brooks a.k.a. 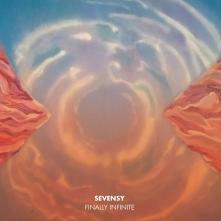 Sevensy after his now considered a classic debut "Beacon", released to much acclaim way back in 2007. While he has stayed busy recording and producing music throughout the years and we have kept compilation tracks, remixes and collaborations coming out in the in-between decade, this outstanding new full-lenth release on Mahorka surely is to bring a much deserved exclusive focus on Sevensy's mesmerizing music. Going through the timeline of the various musical bits and pieces on different collaborative releases on the label, we can follow the evolution of his unique soundcrafting and compositional approaches and now with "Finally Infinite" we get a homogeneous mature milestone album, both modern and timeless.